The third season of TNT's reboot of Dallas will conclude on Monday with two episodes. Hence I'm sharing not one but two new Dallas Drinks today. 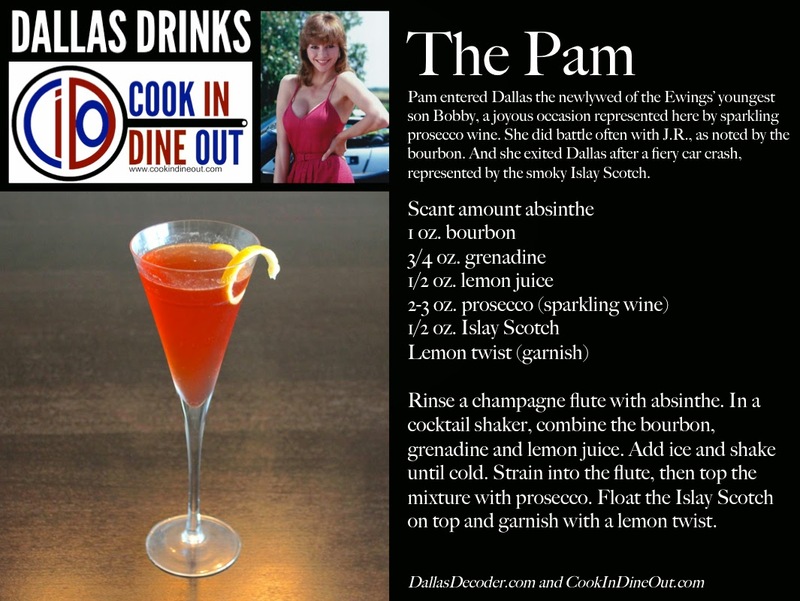 Pam's cocktail charts her time on Dallas from beginning to end. Pam utters the first line of dialogue on Dallas: "Bobby James Ewing, I don't believe you." She had just tied the knot with Bobby, the youngest of Jock and Ellie's three boys. The occasion is marked here with sparkling wine, specifically Italian prosecco. It was a happy time, but tough times were head. During the course of the show, Pam frequently did battle with J.R., represented here by bourbon. Having to put up with the Ewings, it's no surprise that Pam went a little crazy in the fifth season, which this drink's absinthe nods too. Years later, Pam made her exit after a fiery car crash left her disfigured, hence the smoky Islay Scotch. Of course, many will choose to remember her resolve, smarts and good looks--the last of which is represented by the grenadine, which gives the drink a reddish tint not unlike her auburn hair. Rinse a champagne flute with absinthe. In a cocktail shaker, combine the bourbon, grenadine and lemon juice. Add ice and shake until cold. Strain into the flute, then top the mixture with prosecco. Float the Islay Scotch on top and garnish with a lemon twist.